When you want to convert scanned image to text in searchable PDF document, you need to choose an application which supports this kind of functions, including converting image to PDF document, recognizing the text in scanned image file. So the application VeryPDF Image to PDF OCR Converter and VeryPDF Image to PDF OCR Converter Command Line will be the most suitable applications. 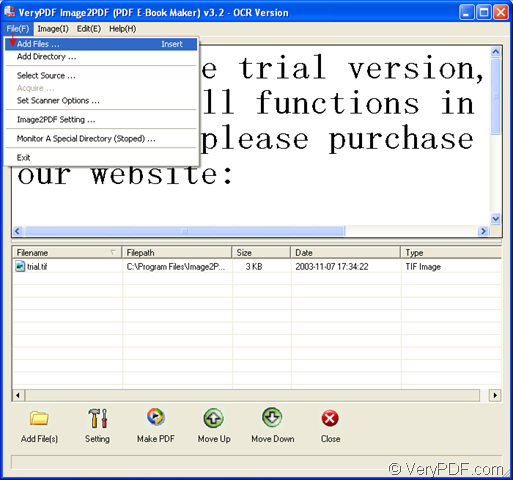 When you use the GUI application Image to PDF OCR Converter, you can download it from its homepage and install the application on your computer. This is only the free evaluation version and you can purchase the application at its homepage, too. In installation procedure, you can create a desktop icon for the application. So when you want to open Image to PDF OCR Converter, you can directly double click the icon or right click it and click “Open” option in dropdown list. Then you will see the main interface of the application. Please see it in Figure 1. You need to add scanned image into the application by clicking “File (F)”—“Add Files” to open file picker window from which you are able to choose the image file you want to convert. Then please click “Setting” button to open “PDF E-Book Maker OCR-Version” dialog box. To convert scanned image to text of searchable PDF document, you need to activate the OCR function by clicking “OCR” tab and checking “Use OCR” option. Then please click “OK” button. For running the conversion, please click “Make PDF” button and click “convert selected 1 file into one pdf file” in the floating item popped up. Then you will be able to save the target file in “Save as” dialog box and run the conversion by clicking “Save” button. The following contents are about converting scanned image to searchable PDF text by command line. So the application used in the conversion is Image to PDF OCR Converter Command Line. You can also download it in the homepage of the GUI application. But you just need to unpack the ZIP file to some location of your computer for using the application. The called program in the command line is the executable file img2pdf.exe. Please open MS-DOS command prompt window for inputting the command line by clicking “Start”—“Run” to open “Run” dialog box and inputting “cmd” in “Open” combo box. Then please click “OK” button. In the interface of MS-DOS, please input the command line for converting scanned image to text of searchable PDF document. "C:\Program Files\image2pdf_cmd3.50_ocr\img2pdf.exe" -x 1 –a Nancy -c -o c:\1.pdf "C:\Program Files\Image2PDF OCR v3.2\trial.tif"
"C:\Program Files\image2pdf_cmd3.50_ocr\img2pdf.exe" stands for the path of called program. -x 1 is to create searchable PDF document. –a Nancy is to set PDF author as Nancy. -c is clear the scanned image file. -o c:\1.pdf stands for the path of target file. Please don’t forget the option “-o”. "C:\Program Files\Image2PDF OCR v3.2\trial.tif" stands for the path of source file. At last, you need to hit “Enter” button to run the conversion from scanned image to text in searchable PDF document. If you want to convert scanned image to text format file, after the conversion mentioned in this article, you need to use the application PDF to Text which can be downloaded at http://www.verypdf.com/app/pdf-to-txt-converter/index.html to meet your requirement. How to rotate the page while converting emf to pnm? How to convert word to pdf ? How to make PDF readable on iPad?